Cnemophilus macgregorii De Vis, 1890, Mount Knutsford, Owen Stanley Range, British New Guinea. Two subspecies. English: Sickle-crested bird of paradise, multi-crested bird of paradise; French: Paradisier huppй; German: Furchenvogel; Spanish: Ave del Paraнso de MacGregor. 9.5 in (24 cm); female 0.17–0.28 lb (79–125 g), male 0.20–0.27 lb (90–120 g). Forehead, ear coverts, and upperparts bright flame yellow with orange wash, dulling in color toward rump and tail. Bill, lores, and underparts a dark brownish black. Orange to olive crest, depending on subspecies. Females brownish olive or brownish gray with darker upperparts. 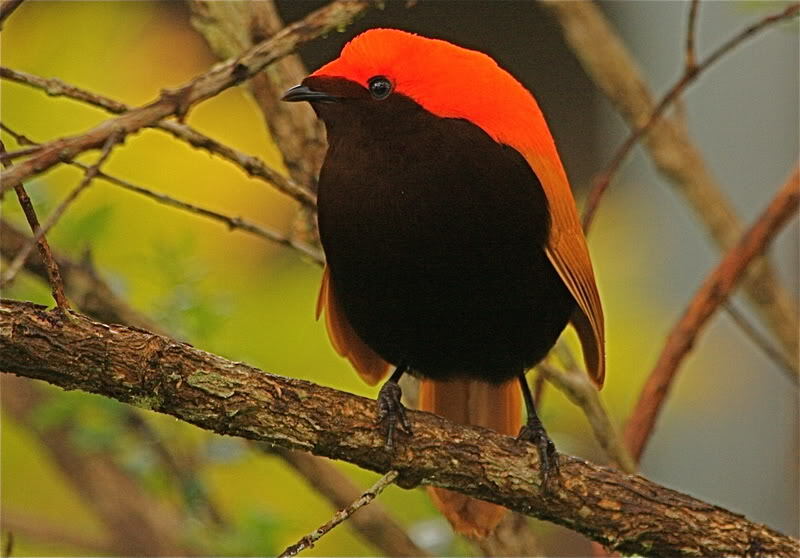 Occurs patchily in high forests of the central cordillera of New Guinea at altitudes ranging from 6,900 to 11,975 ft (2,100 to 3,650 m). 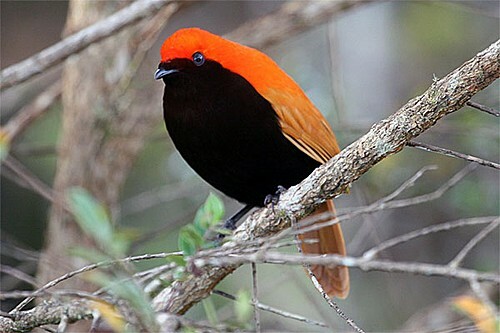 C. m. macgregorii: southeast Papua New Guinea northwestward to at least the Ekuti Divide, east of the Watut/Tauri Gap; C. n. sanguineus: central and eastern Highlands, Papua New Guinea, west of the range of the nominate subspecies. Upper montane and subalpine forest and forest edge, including secondary growth and disturbed forest and shrubbery. 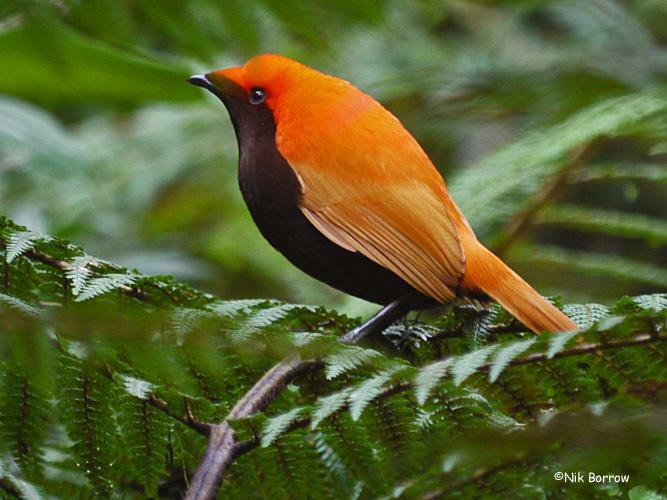 A less vocal species than most birds of paradise. The flight of adult males produces a loud whirring sound. Display season is likely at least June through November. Mostly frequents middle and lower forest structure. Notably exceptional in being an obligate frugivore, both as adults and nestlings. 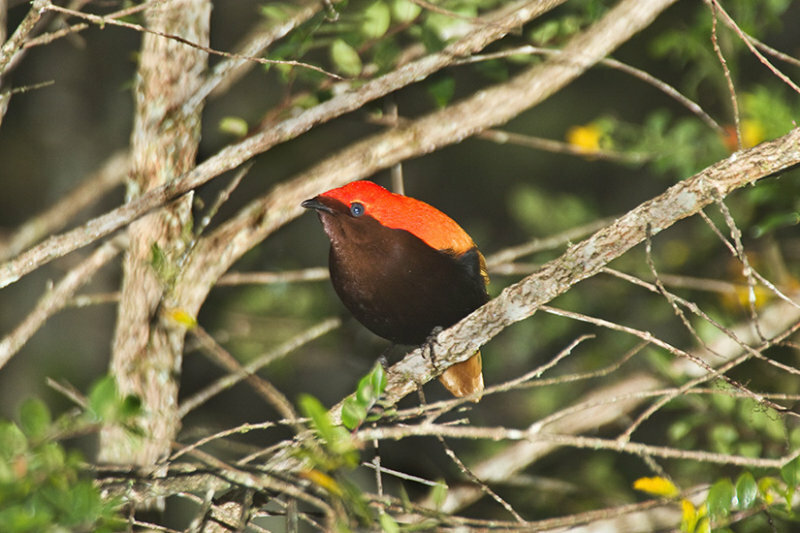 Polygynous, with presumed promiscuous males and exclusively female nest attendance. Breeding at least August through January. Nest is globular, with side entrance, and sits 6.6–13 ft (2–4 m) above ground. Incubation is probably about 26 days or more; nestling period more than 30 days. As only single nestlings have been observed, clutch is probably one egg. Not threatened. 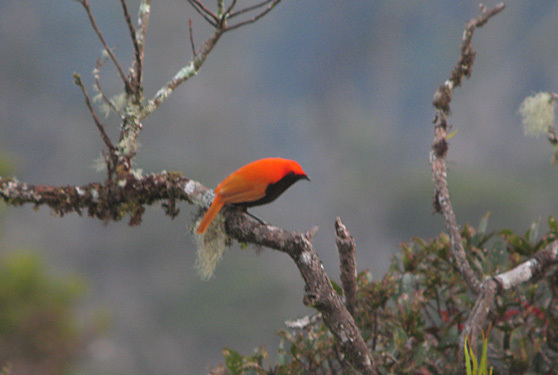 habitat is more restricted than that of many family members, but the vulnerability of this bird, common in optimal habitat, is low because of its higher altitude. Rarely, skins of adult males are used as human adornment.